Multiple Functions, Always Ready for Challenges.–You might encounter various risks and challenges in the outdoors, thats why we add reverse charge, SOS and flashlight to the Armor Mini to make it an ideal companion for your adventures. Tiny Body, Loud Voice.–The Class-k amplifier along with box speaker delivers crystal clear, rich, high-volume stereophonic sound without distortion, offering you a marvelous auditory feast. And even in noisy environments, you will never miss notifications for text messages or phone calls. Small in Size, Big on Performance.–Small as the Armor Mini is, it does not compromise on performance. 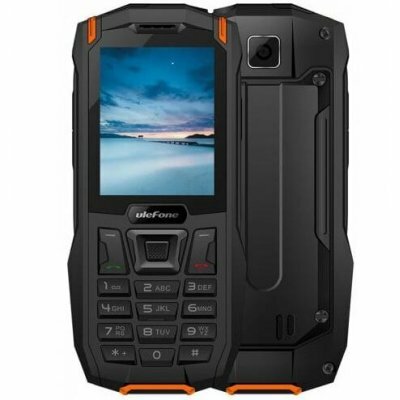 Powered by a MTK6261D processor, its capable of smoothly handling everyday tasks without any delay while consuming less energy, making it hassle free for any outdoor adventure. 0.3MP Waterproof Camera, Capture All Great Moments.–Equipped with a 0.3MP waterproof camera, Ulefone Armor Mini is always ready for that next great moment, allowing you to share the beautiful scenery along the road with your friends and family. IP68 Protection Grade.–Certified with IP68 dust-proof and waterproof rating, the Armor Mini can be submerged in water of upto 1.5 meters for up to 30 minutes. Besides, with well-sealed design, no dirt, dust or sand will get into the phone.